Week 9 2012: Results are in! So this week while I’ve been grading the picks, I’ve had to pull out the red pen a LOT more than usual. It was a pretty rough week all around to be a college football expert on ESPN, with quite a few upsets going down on Saturday. 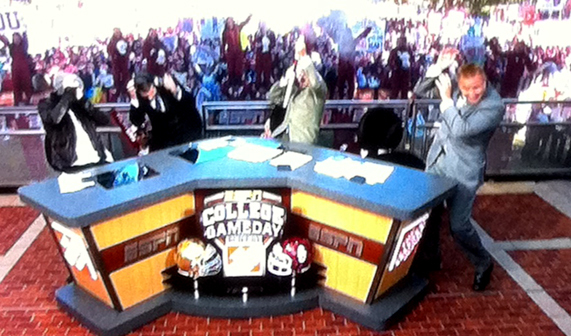 Let’s start with the big matchup for College Gameday, which was at the Oklahoma/Notre Dame game. 19 out of 21 of our ESPN experts picked Oklahoma over Notre Dame this week. That is the most uneven picking we’ve seen this year since week 1 when everyone on the planet wanted it on record that they thought Alabama would beat Michigan except for Desmond Howard. What makes this week more humorous is that the ONLY two experts to predict Notre Dame would beat Oklahoma were Lou Holtz and Mike Golic; the two biggest Notre Dame homers on the face of the planet (also note my girlfriend Jennifer’s upset special was ND over OU). I guess the lesson here is be careful when everyone is picking one way when the spread is only a touchdown. Let’s move on. Our winners this week were not big winners. Pat Forde went 17-10, Lou Holtz went 4-1, and Kirk Herbstreit went 10-5. We’ll give this week’s win to Lou Holtz for the Notre Dame pick, and the smug-level he will emit Friday night on ESPN will be THROUGH THE ROOF. 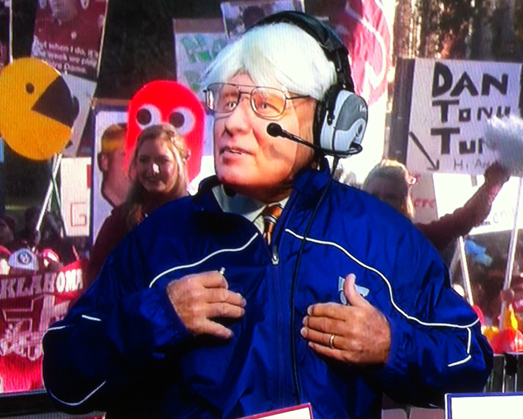 Lee Corso’s headgear pick of OU over Notre Dame lost, which put him at 8-6. Our celebrity guest Nathan Followill went 4-5, so combined with his appearance a few years ago he is 7-12 all time. Most of our experts went around .500 this week, but we had some big losers. Desmond Howard decided to mail it in and went 3-9, so we’ll give him the official loss for those of you counting. David Pollack went 3-4 which I think is his first losing week of the year. BCS guru Brad Edwards was a close second at 3-8. Other than that, please consult the results below to see how your favorite (or most hated) personality did on picks this week. Well folks, if you’re reading this then that means we’ve officially put another edition of College Gameday in the books. Today we broadcasted live from Norman, Oklahoma for the big matchup between the Sooners and the Notre Dame Fighting Irish. As we opened the show, Chris Fowler reminded us that it has been something like 56 years since Oklahoma has beaten Notre Dame. Granted they haven’t played very often, but that’s still a long time. The usual morning crew was present with Samantha Steele taking over hosting duties, and her buddies Desmond Howard and David Pollack were riding shotgun for the first hour on ESPNU. Jennifer loved the outfit Samanthat Steele had on this morning, and thought it was the best of the year. Speaking of Samantha Steele, I am starting to wonder if they pre-tape some of her segments from Gameday. It kept going from light to dark when she was on, so its either pre-taped, or the sun does very unusual things in Norman. Samantha Steele: Welcome to the show! The first hour of the show was pretty slow this morning. 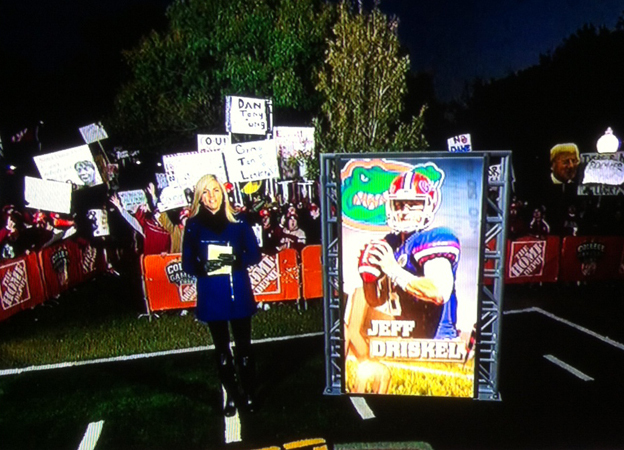 We got a replay of Gene W.’s piece on Jeff Driskell from last week. 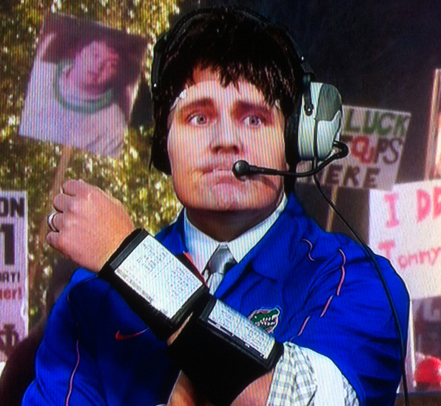 We got Todd McShay breaking down some generic video from the studio. The highlight of the show was Samanthat Steele introducing us to some 4 year old kid who has parents that were Notre Dame fans. 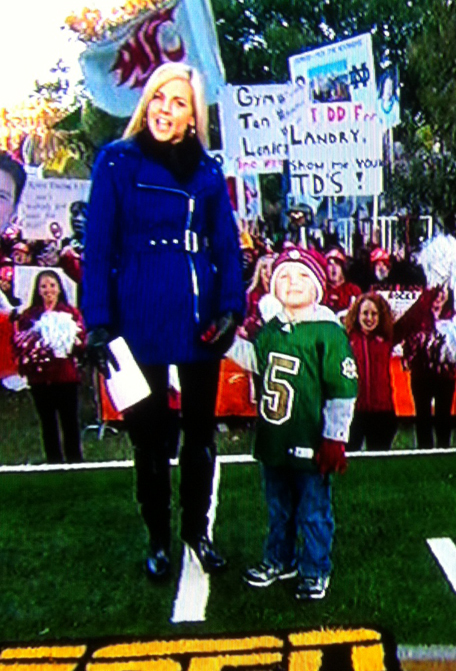 They named him Brady, after former Notre Dame QB Brady Quinn, because… well why wouldn’t you name your kid after Brady Quinn? Brady Quinn fan? Name your kid Brady! The first hour on ESPNU ended with Des and Dave making their picks for the day. David is still riding the Beaver train, with Desmond reluctantly riding along as well. David got some nice boos from the crowd when he picked KState, since KState beat OU already this year. Both guys went with Oklahoma over Notre Dame and were applauded. The main show opened up on ESPN with Fowler taking back hosting duties from Sam Steele, and they sent David Pollack to go use the internet somewhere. 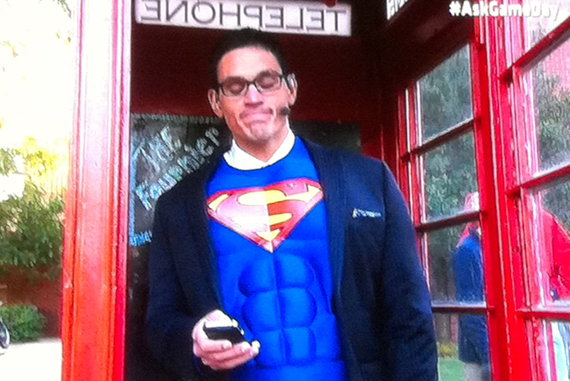 This week, he was in a telephone booth tweeting dressed in a Superman costume. I guess this was for Halloween but it was never really explained. Its a bird? Its a plane? Looks like David Pollack. 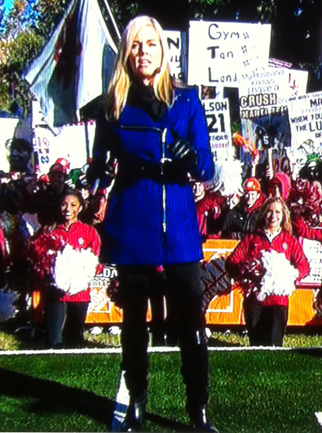 I guess it must have been cold in Norman this morning, because Samantha Steele was bundled up for a blizzard. More importantly, we learned that Herbie had a pile of hand warmers and was wearing a blanket underneath the Gameday Desk. How cute. We had a few decent signs, although I’m sure I probably missed some good ones too. 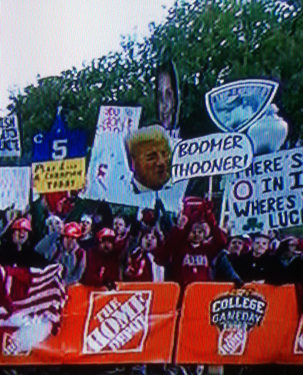 Today’s highlights include the “Gym, Tan, Landry” sign, the “I couldn’t think of anything” sign, the “Rudy was a C Student” sign, and “Brian Kelly buys Lou Holtz Depends”. This week’s winner was the one below, even though there was at least one duplicate of this floating around. I enjoyed it. As our crew started breaking down games, they briefly mentioned the game between the Oregon Ducks and the Colorado Buffaloes, and took this opportunity to kick Chris Fowler squarely in the crotch since he went to Colorado and they are a HUGE underdog against Oregon. There was some discussion about what teams might be on “letdown alert” this week, and I would like to take a minute to address this. I have long been aware of the following concepts: upset watch, upset alert, upset special. However, this is the first season I’ve heard the term “letdown alert”. I’m not a fan of this term, as it seems to me that it is basically a half-assed upset alert. Some day I will break down my official rules for putting someone on upset watch/alert/special, but we’ve got too much to do here today for me to get into that. End rant. We FINALLY got to the part you’ve all been waiting for, as the guys took a minute to break down the heated matchup going down today between Lock Haven and Gannon. Lock Haven hasn’t won a game since 2007, and is currently riding a 48 game losing streak which is the all time D2 record. Coach Corso and Desmond took Lock Haven to shock the world and pick up a win today, with Herbie picking Gannon over Lock Haven which is where the sharp money is at. After that, we got a Gene W. piece about KState coach Bill Snyder. We learned the story of how he took over Kansas State when they were THE worst team in major college football, and turned them into a national powerhouse. Then he retired. Then things went downhill. Then he came back. Things are now back on track, and they are one of the best teams in the country. 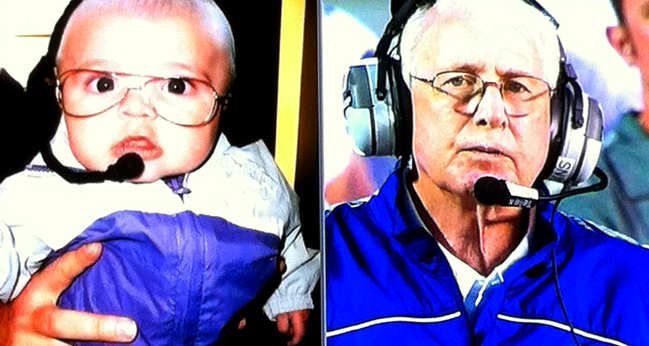 The highlight of this piece was the baby Bill Snyder which was featured. Bill Snyder. Bill Snyder baby. 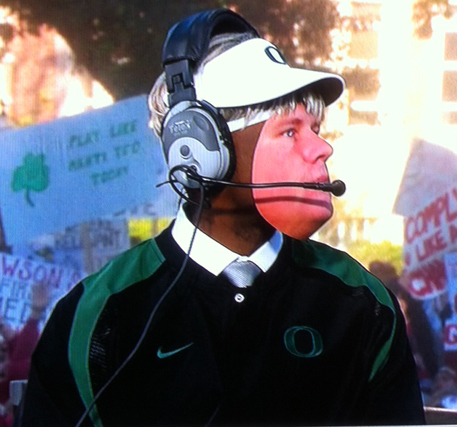 Up next, let us speak of what is probably the most bizarre segment I’ve ever seen on College Gameday. It was teased earlier in the show that we would hear from the top five ranked coaches in the country to get some feedback on how the season is going. What we were given is very hard to explain. 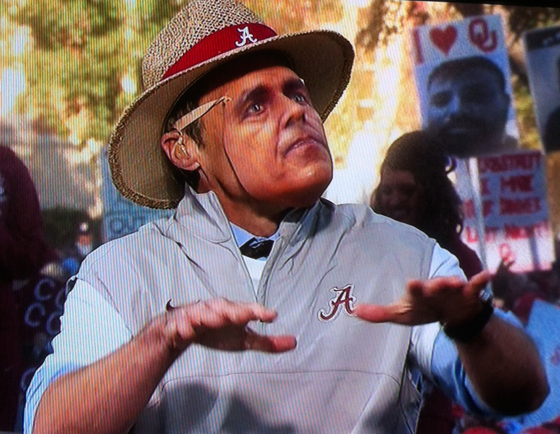 We got our five main hosts of Gameday dressed up as the five head coaches, including uniforms and incredibly creepy masks, and each one did some schtick about their team which was pretty funny. We had Coach Corso as Bill Snyder, Herbie as Will Muschamp, Fowler as Nick Saban, David Pollack as Brian Kelly, and Desmond Howard as the black Chip Kelly. Some of the impressions were pretty spot on, including the Snyder and Saban impressions. See below to understand better. Let’s move on. We got a quick 30 second Tom Rinaldi piece about Notre Dame entitled “Relevance”. I still don’t understand these segments where Tom Rinaldi rambles on about something obscure for 25 seconds, then plasters a big title card on the screen with his name on it. I think I figured out why they drive me just a little bit crazy. 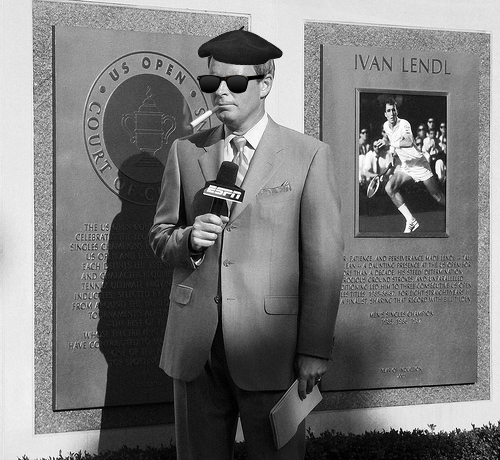 I feel like each one of these pieces was written by Tom Rinaldi, and that he performs them live the night before Gameday at some beatnik poetry night at a coffee shop while wearing a beret and smoking a cigarette. “What is relevance? What does it mean to be relevant? How does one become relevant? Does one need to prove their relevance to be relevant? The Fighting Irish represent these questions. 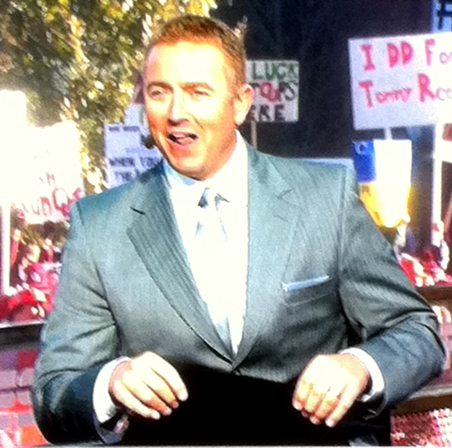 I’m Tom Rinaldi”. We got the usual Tom Rinaldi queit talking piece, except this week it was hosted by Samantha Steele. She did a story about Jonathan Banks from Mississippi State. He is on his way to being an All-American, and is expected to play on Sundays. However, he has had a tough road to get to where he is. When he was a baby, his mother abandoned him and he was left to be raised by his father and grandparents. His father worked 16 hour days as a log cutter to support him, until he was tragically killed in a car accident when Jonathan was 8. His grandparents raised him the rest of the way, and he turned into a stud athlete in higschool playing baseball, basketball and football. Things were looking great, until he impregnated his girlfriend at age 18 as a senior. He now has an 18 month old son who he strives to spend time with while balancing school and football, but he makes the extra effort because it reminds him of the time he spent with his dad. Really great piece. Tom Rinaldi had his own full segment interviewing Landry Jones. I didn’t pay much attention to this, other than the fact that Landry Jones takes most of the blame for losing to KState. But enough of that; its time to get down to the business we all came here for. The picks. Today’s special guest celebrity was none other than the drummer from Kings of Leon; Nathan Followill. You might be saying “HEY COLE! HASN’T HE BEEN THE GUEST CELEBRITY PICKER BEFORE?” and the answer is yes. Just check my page on the Guest Pickers. Chris Fowler welcomed him back, wished him luck, and said he did great last time he was on the show. He did great last time he was on the show, except for the fact that he went 3-7. Oops. All of Saturday morning’s picks can be found HERE for your reference. His highlight today was picking Auburn when asked who he liked between Oregon State and Washington (a nice Ryan Lochte reference from last week). When it came down to that time, Followill went with Oklahoma to nobody’s surprise. Herbie is calling the game tonight with Big Game Brent, so there was no pick there. 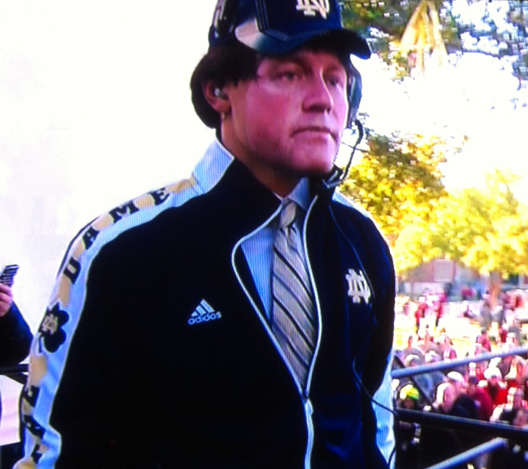 Would Coach Corso be the only one to pick Notre Dame other than Dr. Lou? NO WAY. He donned the Sooner headgear, and started firing the Sooner guns into the air. He almost fell off his chair, and everyone went running for cover as you can see below. Enjoy your day of football folks. YOU’RE LOOKING LIVE… at another blog post, and if I’m posting a blog this early in the morning then it MUST be Saturday. 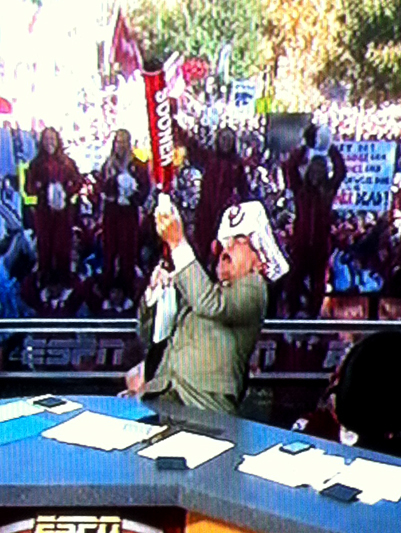 If its a Saturday morning in this fall, then Gameday IS in fact comin’ to your citaaaaay. Gameday is fired up on the main screen, Sportscenter is going on the second screen, and the rojo tea is flowing. The broadcast is coming live from Norman, Oklahoma for the big matchup between Oklahoma and Notre Dame today. Currently our experts are favoring Oklahoma over Notre Dame with a margin of 16 to 1. Any guesses to the one? Yes yes, Lou Holtz shocked the world and called for the upset. Picks from earlier this week can be found HERE and HERE. As the picks roll in this post will be updated, so check back and check back often to make sure you see who everyone is riding today.